I received a copy of Warriors very recently and even though I have only read a couple of the stories in this anthology so far, I wanted to get the word out that based on the two stories I have read to date, The Girls from Avenger by Carrie Vaughn and Seven Years from Home by Naomi Novik, this is going to be an incredible collection. I never cared about such differences. It seemed, to me, then as now, that there were good stories and bad stories, and that was the only distinction that truly mattered. 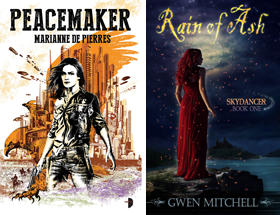 Carrie Vaughn's story is a WWII tale and Naomi Novik's contribution is science fiction. This was the first story that I read in the collection because I love Vaughn's Kitty Norville tales. The Girls from Avenger tells the story of Emily (Em) Anderson, a civilan aviator working at army fields in the US ferrrying planes around the country to where they are needed for the war effort. The death of a fellow flyer and close friend in a crash sends Em seeking the truth of the circumstances surrounding the event. Pitted against the many gender obstacles faced by women at that time Em is determined to understand the why and make meaning of her friends death. The Girls from Avenger is incredibly vivid; it dropped me into the time and place effortlessly, the period details seemlessly blended and authentic. But most importantly was the emotional impact this story had for me, the poignancy and especially the depth of Em's courage, not defined by battle, but by her perseverance, her sense of duty and optimism. A gem of a story. Told in flashback, journal style, Seven Years from Home is the personal story of Ruth Patrona, a diplomat assigned by the ruling Confederacy to a planet with two vying factions. The factions are genetically different and philosphically apposed culturally and otherwise. Ultimately it is Ruth's job to get her assigned faction to negotitate and join the Confederacy through any means necessary. Instead, following a "Dances with Wolves" motif, Ruth falls for and joins the alien culture, but still doesn't abandon her primary mission. Ultimately the colonialistic maneuvers of the Confederacy result in terrible and ugly consequences for the planetary cultures and Ruth in particular. The story is full of twists and turns and the denoument shows the horrible price paid by Ruth. Again I found the story emotianally satisfying and compelling. Highly recommended. As I suggested earlier, based on the two stories I have had time to read so for, Warriors has the potential to be one of the strongest anthologies in or out of genre published this year. Warriors releases March 16, 2010 from Tor Books. Fans of George R.R. Martin's A Song of Ice and Fire fantasy series will be particularly interested in the new "Dunk and Egg" novella that is included. This looks superb. Thanks for the cranium's up. This novella sounds really interesting. Do you know if the stories in here are based on the books the authors already have out? Or are the new stories? There are many authors I have not yet had the opportunity to get to reading yet and I don't want to be lost in the stories. Blodeuedd Novik's story was amazing and so completely different from her fantasy. So far its excellent Vickie. Abigail I suspect a lot of folks will buy this on that strength alone, but there is indeed lots of gravy. Melissa they are nearly all totally new and original stories not based on any ongoing series. As far as I can tell only the Gabladon story and the Martin story come from their previous work and I suspect they don't really require familiarity with the other books to enjoy them. Thanks Doug. This makes me want the book even more. These sound like some great stories. Thanks for your review, I look forward to the release of this anthology soon.